I frequently hear from friends that they don’t get away because they can’t afford to travel. Would you believe me if I told you all you need for your next vacation is $500 and a little time? And the best part is you don’t have to come up with the money! 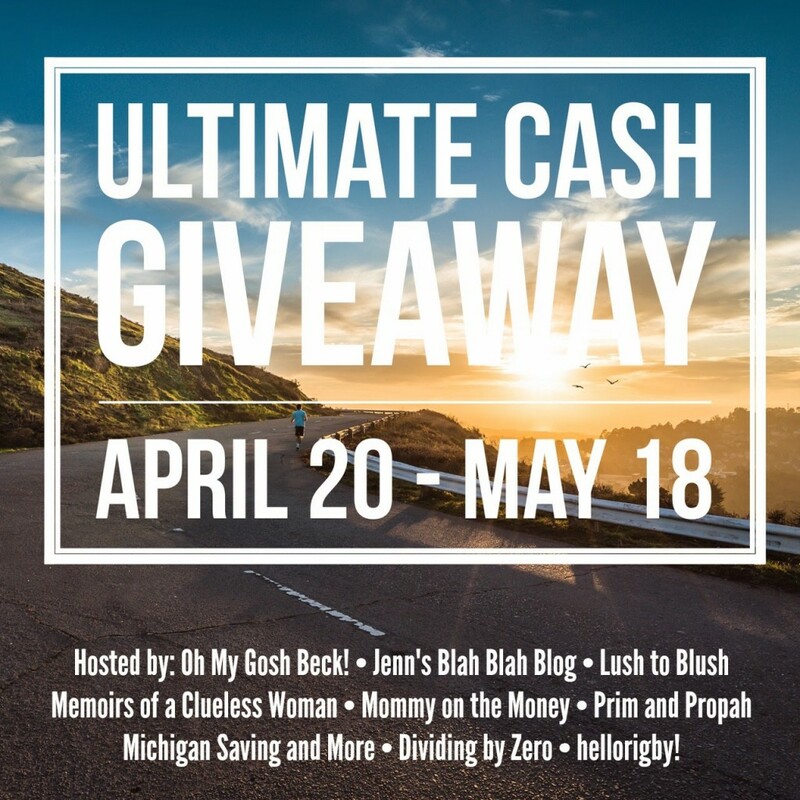 I’ve teamed up with a few other bloggers for the Ultimate Cash Giveaway and we’re offering a $500 cash prize (scroll to the bottom of this post to sign up now!). Need a little help deciding where to go with that money? 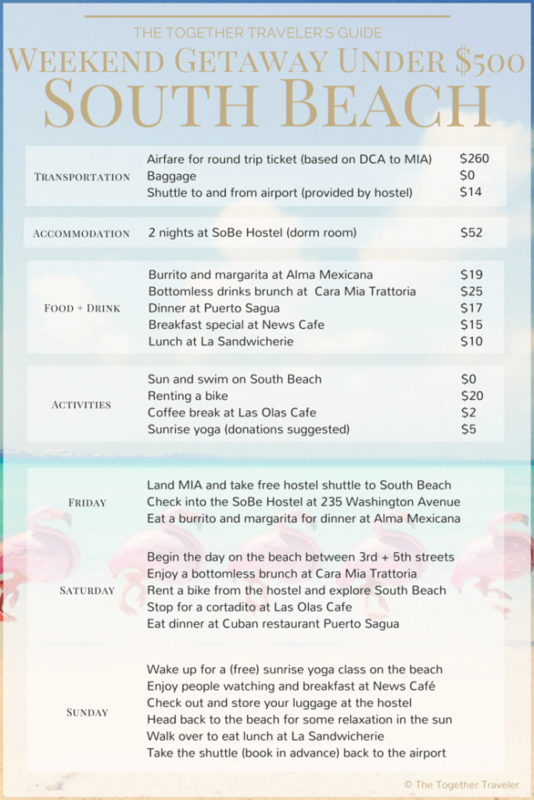 I’ve planned out a beach weekend getaway that rings in at just under $500. 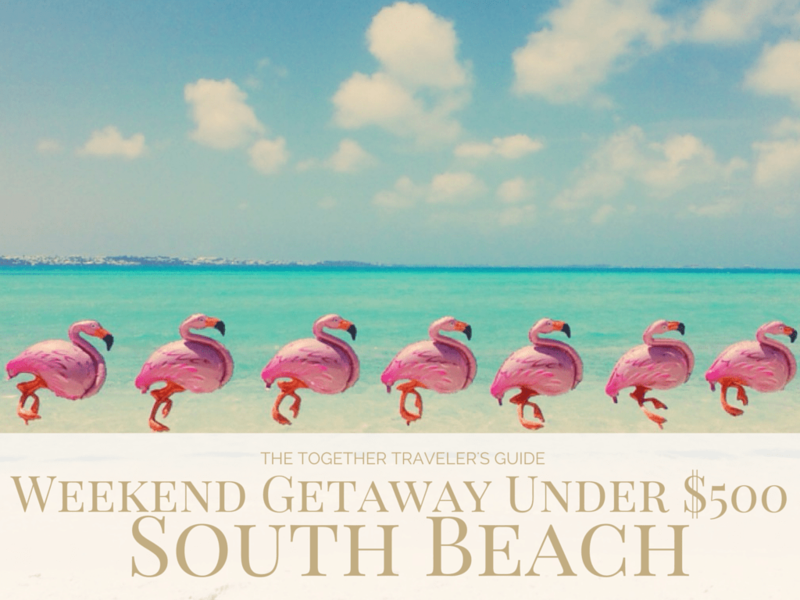 South Beach is the perfect place to get away for a quick tropical escape. Stay at the SoBe Hostel for $26 a night. If you’re going with friends you can split a room at The Clay Hotel or snag an airbnb rental for roughly the same cost. After checking in, grab dinner at Alma Mexicana where Alma will craft a delicious burrito with special green Chile sauce for $7.50. Order a $7 margarita to go with that. Your bill will come in around $19. Sleep in Saturday or roll out of bed early with the sun to enjoy some quiet time on the beach. Locals hang out between 3rd and 5th streets. Cara Mia Trattoria offers a bottomless brunch menu with your choice of mimosas, bellinis or Peroni drafts for just $19.95. After brunch rent a bike for $20 from the hostel or at one of the bike shops. Follow Sonia Gil’s guide for exploring South Beach on bike and you’ll get the full experience. Afterwards don’t forget to stop at Las Olas Cafe to order a cortadito like Sonia for an afternoon pick-me-up. Eat dinner at the well-known Cuban restaurant Puerto Sagua. Your bill will set you back less than $20. Wake up early for a free yoga class on the beach at 3rd street. Grab breakfast outside at News Cafe and joy the people watching. The breakfast special will only cost you $12. After breakfast pack up and check out of the hostel. They offer luggage storage so you can still enjoy your remaining time in South Beach. Spend the rest of the time before your return flight relaxing on the beach. This weekend getaway adds up to ONLY $174 leaving you with $326 for airfare. Where would you go with $500? P.S. If you haven’t signed up to support my cause yet, you can make a difference in just three easy steps: just sign up, click “Support This Campaign” and shop. You don’t have to buy anything, however once the discount codes are unlocked I can’t promise you will be able to resist the urge to buy! This all goes to support a very important cause in DC.Want the resources I used to build this guide? Thanks for this great big giveaway! I’d love to fly away to some beach vacation if I win! A beach vacation is exactly what I’d do too! You did an excellent job on a beach getaway. And I love the beach. Instead of sightseeing we roll out of bed and head to the beach for a relaxing day. Thank you so very much for helping to make this incredible giveaway opportunity possible!!! Thanks Christy! I love just lounging on the beach all day too but after watching Sonya Gil’s videos I’d really like to bike around South Beach!